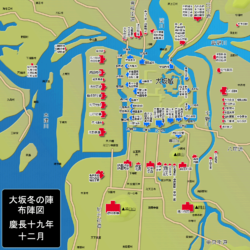 The Siege of Osaka (大坂の役, Ōsaka no Eki, or, more commonly, 大坂の陣 Ōsaka no Jin) was a series of battles undertaken by the Tokugawa shogunate against the Toyotomi clan, and ending in that clan's destruction. Divided into two stages (Winter Campaign and Summer Campaign), and lasting from 1614 to 1615, the siege put an end to the last major armed opposition to the shogunate's establishment. The end of the conflict is sometimes called the Genna Armistice (元和偃武, Genna Enbu), because the era name was changed from Keichō to Genna immediately following the siege. Tokugawa shogunate victory; all threats to the shogunate temporarily eliminated. When Toyotomi Hideyoshi died in 1598, Japan came to be governed by the Council of Five Elders, among whom Tokugawa Ieyasu possessed the most authority. After defeating Ishida Mitsunari in the battle of Sekigahara in 1600, Ieyasu essentially seized control of Japan for himself, and abolished the Council. In 1603, the Tokugawa shogunate was established, with its capital at Edo. Ieyasu sought to establish a powerful and stable regime under the rule of his own clan; only the Toyotomi, led by Hideyoshi's son Toyotomi Hideyori under the influence of his mother Yodo-dono, remained an obstacle to that goal. The siege began on 19 November, when Ieyasu led 3,000 men across the Kizu River, destroying the fort there. A week later, he attacked the village of Imafuku with 1,500 men, against a defending force of 600. With the aid of a squad wielding arquebuses, the shogunate forces claimed another victory. Several more small forts and villages were attacked before the siege of Osaka Castle itself began on 4 December. The Sanada-maru was an earthwork barbican defended by Sanada Yukimura and 7,000 men, on behalf of the Toyotomi. The Shōgun's armies were repeatedly repelled, and Sanada and his men launched a number of attacks against the siege lines, breaking through thrice. Ieyasu then resorted to artillery (including 17 imported European cannons and 300 domestic wrought iron cannons) as well as men to dig under the walls. On 22 January the Winter Siege was ended, with Toyotomi Hideyori pledging to not rise in rebellion. He also allowed Ieyasu to tear down the walls of the outer layer of defenses, and fill in the outer moat of Osaka Castle. In April 1615, Ieyasu received word that Toyotomi Hideyori was gathering even more troops than in the previous November, and that he was trying to stop the filling of the moat. Toyotomi forces (often called the Western Army) began to attack contingents of the Shōgun's forces (the Eastern Army) near Osaka. On 26 May (Keichō 20, 29th day of 4th month) at the Battle of Kashii Osaka forces under the command of Ono Harufusa and Ban Danemon engaged with forces of Asano Nagaakira, an ally of the Shōgun. Osaka forces sustained a loss and Ban Danemon was killed. On 2 June (Keichō 20, 6th day of 5th month), the battle of Dōmyōji took place. Osaka forces tried to stop the Tokugawa forces approaching from Yamato Province along the Yamato-gawa river. Two Osaka generals, Gotō Matabei and Susukida Kanesuke, were killed in action. Osaka forces commander Sanada Yukimura engaged in a battle with Date Masamune forces, but soon retreated towards Osaka Castle. Tokugawa forces did not pursue Sanada. The same day Chōsokabe Morichika and Tōdō Takatora battled at Yao. Another battle took place at Wakae around the same time, between Kimura Shigenari and Ii Naotaka. Chōsokabe's forces achieved victory, but Kimura Shigenari was deflected by the left wing of Ii Naotaka's army. The main Tokugawa forces moved to assist Todo Takatora after Shigenari's death, and Chōsokabe withdrew for the time being. After another series of shogunate victories on the outskirts of Osaka, the Summer Campaign came to a head at the battle of Tennōji. Hideyori planned a hammer-and-anvil operation, in which 55,000 men would attack the center of the Eastern Army, while a second force, 16,500 men led by Kyōgoku Tadataka, Ishikawa Tadafusa, and Kyōgoku Takatomo, would flank them from the rear. Another contingent waited in reserve. Ieyasu's army was led by his son, the Shōgun Tokugawa Hidetada, and numbered around 155,000. They moved in four parallel lines, prepared to make flanking maneuvers of their own. Mistakes on both sides nearly ruined the battle, as Hideyori's rōnin split off from the main group, and Hidetada's reserve force moved up without orders from the main force. In the end, however, Hideyori's commander Sanada Yukimura was killed, destroying the morale of the Western Army. The smaller force led directly by Hideyori sallied forth from Osaka Castle too late, and was chased right back into the castle by the advancing enemies; there was no time to set up a proper defense of the castle, and it was soon ablaze and pummeled by artillery fire. Hideyori committed seppuku, and the final major uprising against Tokugawa rule was put to an end, leaving the shogunate unchallenged for approximately 250 years. According to an account by an employee of the Dutch East India Company in Hirado, several daimyō set the castle on fire and attempted to defect to Ieyasu. Hideyori executed them by throwing them off the castle wall but could not extinguish the fire, causing his suicide. The account also stated that about 10,000 people died. History indicates that the legendary swordsman Miyamoto Musashi participated in the battle on the Toyotomi side, though he has no recorded accomplishments in this battle. Hideyori's son Toyotomi Kunimatsu (age 8) was captured by the shogunate and beheaded in Kyoto. According to legend, before his beheading, little Kunimatsu bravely blamed Ieyasu for his betrayal and brutality against Toyotomi clan. Naahime, daughter of Hideyori, was not sentenced to death. She later became a nun at Kamakura's Tōkei-ji. Hideyoshi's grave was destroyed by the shogunate, along with Kyoto's Toyokuni Shrine. Chōsokabe Morichika was beheaded on May 11 while his gang member Ono Harunaga, who was wanted for over 10 years, was killed on June 27. There are also records of pillaging and mass rapes by Tokugawa forces at the closing of the siege. The bakufu obtained 650,000 koku at Osaka and started rebuilding Osaka Castle. Osaka was then made a han (feudal domain), and given to Matsudaira Tadayoshi. In 1619, however, the shogunate replaced Osaka Domain with Osaka Jodai, placed under the command of a bugyō who served the shogunate directly; like many of Japan's other major cities, Osaka was for the remainder of the Edo period not part of a han under the control of a daimyō. A few daimyō including Naitō Nobumasa (Takatsuki Castle, Settsu Province 20,000 koku) and Mizuno Katsushige (Yamato Koriyama, Yamato Province 60,000 koku) moved to Osaka. The Toyotomi clan was then disbanded. After the fall of the castle, the shogunate announced laws including ikkoku ichijō (一国一城) (one province can contain only one castle) and Bukeshohatto (or called Law of Buke, which limits each daimyō to own only one castle and obey the castle restrictions). The shogunate's permission had to be obtained prior to any castle construction or repair from then on. Many castles were also forced to be destroyed as a result of compliance with this law. Despite finally uniting Japan, Ieyasu's health was failing. During the one-year campaign against the Toyotomi clan and its allies, he received wounds that significantly shortened his life. Roughly one year later on June 1, 1616, Tokugawa Ieyasu, the third and last of the great unifiers, died at the age of 75, leaving the shogunate to his descendants. The siege is the subject of the Hiroshi Inagaki's historical drama "Ōsaka-jō monogatari" (engl. The Tale of Osaka Castle, UK; some other English titles: "Daredevil in the Castle", "Devil in the Castle", "Osaka Castle Story") (1961) with Toshiro Mifune in the leading role. It is also the backdrop for Tai Kato's musical film Brave Records of the Sanada Clan (1963). The fall of Osaka is (for most of the characters) the final level in the Samurai Warriors series, also serving as the climax of Hattori Hanzō's, Ieyasu's and Yukimura's stories. Called the "Osaka Campaign", it compiles all the battles of the Winter and Summer Campaigns. In the computer game Shadow Tactics: Blades of the Shogun, the siege of Osaka castle is the setting of the first (and demo) mission. ^ Turnbull, Stephen (2012). Osaka 1615: The Last Battle of the Samurai. Illustrated by Richard Hook. Osprey Publishing. ISBN 9781782000099. ^ "Document on 17th century 'Siege of Osaka' found in Dutch national archives". The Mainichi. 2016-09-22. Retrieved 22 September 2016. ^ Jennifer Mitchelhill (2003). Castles of the Samurai: Power and Beauty. Kodansha International. p. 67. ISBN 978-4-7700-2954-6. ^ "Sanada fūunroku" (in Japanese). Japanese Cinema Database. Archived from the original on 31 October 2010. Retrieved 30 October 2010. Turnbull, Stephen. (2006). "Osaka 1615: The Last Samurai Battle." Osprey Publishing, Westminster, MD.